This Memorial Day, in Cleveland and across the nation, there were countless photo opportunities with all the parades, rib burn-offs and countless neighborhood get-togethers. When there’s that much happening, a large storage photo media card is definitely in order. You don’t want to run out of photo storage space when the action’s still happening. 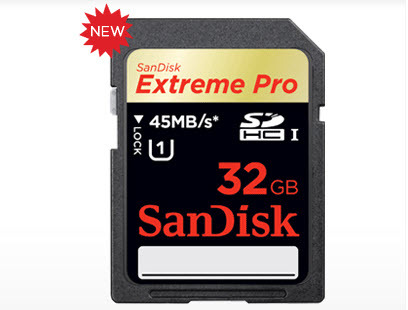 SanDisk makes sure you can keep shooting with their large capacity, Extreme Pro line of SDHC cards in 8GB, 16GB and 32GB sizes. With up to 45MB/s read/write speeds (300X) you’ll get better shot-to-shot performance than with just about any other card you are probably using presently. I was amazed at the increase in number of shots I could shoot in succession before the buffer slowed me down. If you are shooting HD video with your DSLR, you know how fast your file sizes can build up. With the extremely quick write speed of this card, you’ll be able to shoot longer segments without those dreaded dropped frames. If you are shooting both RAW and JPEG simultaneously, you’ll notice a definite increase in the number of shots you can take before your buffer fills. When you are shooting action sports, that can often be the difference in catching that peak action shot. Purchasers of their Extreme line of cards also qualify for a free one-year subscription to RescuePRO recovery software. 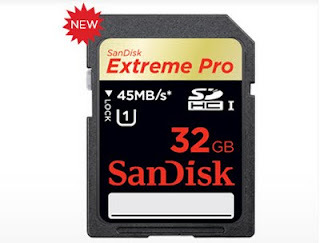 You can order direct from the manufacturer online at http://sandisk.com or just about any reputable camera store across the country.